There are over 1000 miles of rivers and streams in the area. The Nooksack River with its three branches- North Fork, Middle Fork, and South Fork- is the major river system. Stream flows in each of the forks combine just east of Deming, forming the main stem of the Nooksack River that flows to Bellingham Bay in the Strait of Georgia. The three forks of the Nooksack River are important areas for recovery of ESA-listed Chinook salmon. Information about our water resources and salmon recovery programs are found at wria1project.whatcomcounty.org and whatcomsalmon.whatcomcounty.org, respectively. 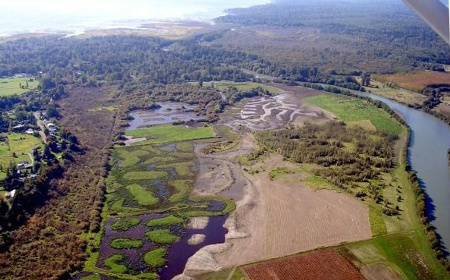 An aerial view of the southern section of the Washington Department of Wildlife 650 acre Lower Nooksack Wildlife area where floodplain, riparian, and wetland restoration work has been underway since 2000. 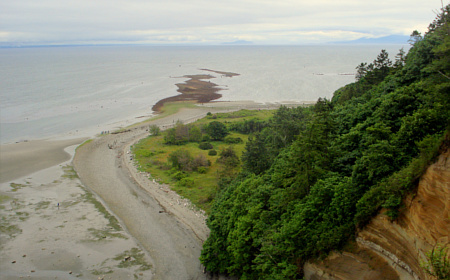 Lily Point's strategic location, its large undeveloped natural shoreline, and its mature upland forests, riparian vegetation, eroding cliffs, and ecologically rich tidelands give this project regional and international significance. 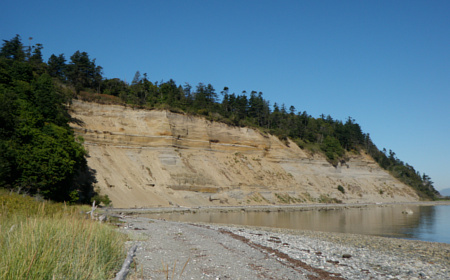 Lily Point is classified as one of the exceptional feeder bluffs in the region, providing spawning substrate for forage fish utilized by juvenile Chinook salmon. For centuries, Chelhtenem was a center of salmon culture and a spiritual place for the Natives. 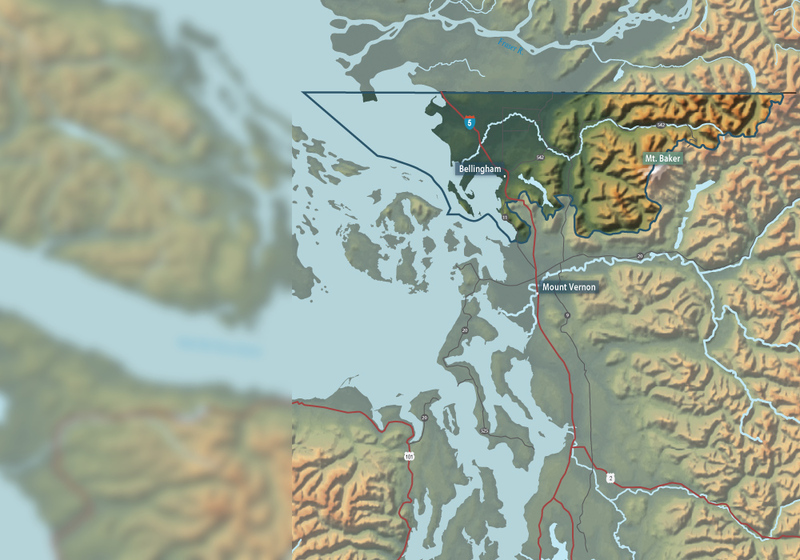 Lily Point was the most important Native reef net fishery and one of the most significant salmon fisheries of the Central Coast Salish. In the late 19th century, non-Indian fish traps displaced traditional reef nets. 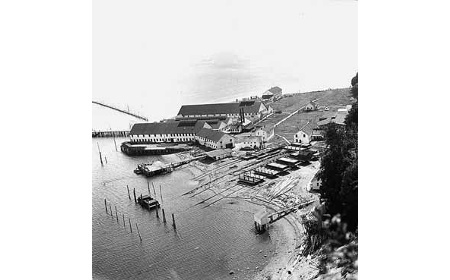 Alaska Packers purchased a year old cannery at Lily Point in 1884. the cannery was abolished in 1917, leaving pilings and debris still visible today. 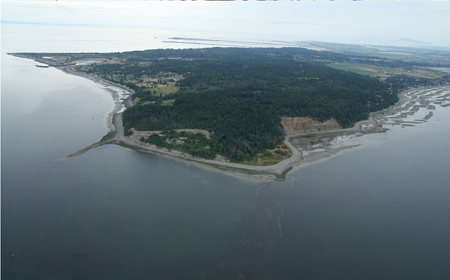 Boundary Bay, whose ecological health is directly linked to Lily Point, has been recognized as an Important Bird Area. 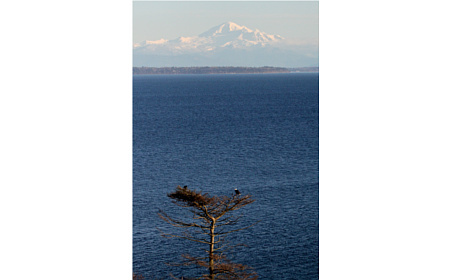 The forests provide perching, foraging and nesting habitat for a variety of birds, including bald eagles.